When you decided to purchase your Sailfish boat fit with a T-Top, you knew good quality when you saw it. Every time you step into it, it’s like jumping head first into paradise. Keeping your Sailfish looking, functioning and feeling brand new is a task, but a worthwhile one at the least. Having a quality boat cover is one of the most important items you can get for your Sailfish to ensure top protection for your investment. It will do what you can’t, it can provide round-the-clock protection against many external elements that can wreak havoc on your boat when you’re simply not there to stand guard. Remember that not all Sailfish boat covers are the same. These are the top ways you can keep your paradise on water looking, feeling and functioning like-new for years to come. The thought of pooled water sitting inside a boat is cringe-worthy. Understandably so. 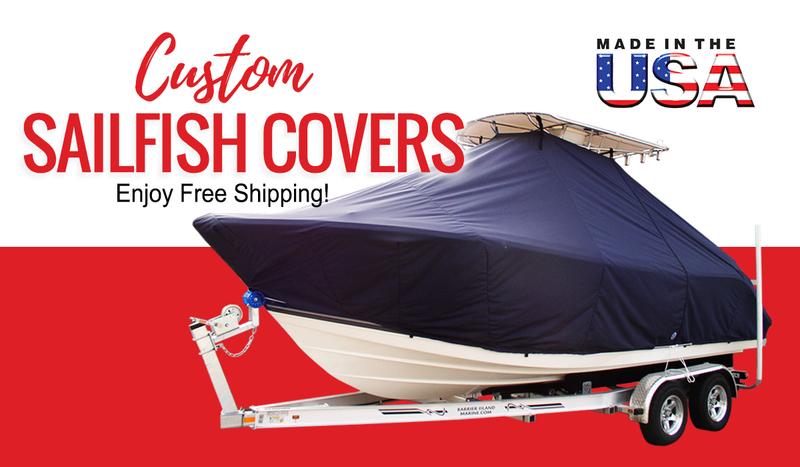 A custom fit Sailfish boat cover enables you to keep water and moisture outside of your boat and into the lake, ocean or river, where it belongs. Excess moisture from humidity and other elements can take a huge toll on your boat but with a custom fit Sailfish boat cover, you can keep it dry and clean to make certain that it remains in as good of condition as it was on that beautiful day you bought it. A key performance element in Taylor Made Products’ Sailfish boat covers is that they attach right under your T-Top, which leaves space for humidity to escape but will be protected from weather conditions under the T-Top. A custom-fit Sailfish boat cover will prevent the buildup of mold and mildew that other covers can leave behind. It is important for your cover to have been made with fabric that has mildew-resistant properties, as all of Taylor Made Products’ custom covers are. They are sewn to fit comfortably across your boat to prevent overhanging areas that would otherwise need to be folded up. These folded up areas that you would find on other covers are often where mold accumulates as the moisture gets trapped within. The last thing you want is for the mold to spread to the inside of your boat. A seamless fitting cover is a great way to protect your Sailfish while keeping it looking new. Like people, boats need protection from the harmful effects of UV rays, too. Lengthy exposure to the sun can cause your Sailfish boat to fade on the inside and even crack over time due to the exposure of those rays. A custom Sailfish boat cover provides protection from the sun’s rays and prevents fading and cracking from occurring. Taylor Made’s custom Sailfish boat covers come with webbing straps and adjustable clips that enable you to adjust and position the cover in a manner that provides maximum protection from the sun. Birds, as necessary as they are for the ecosystem, they are quite the boater’s nuisance. An uncovered, open boat to a bird is like a hole-in-one, to a golfer. Don’t help their cause, help yours. Get your boat covered today, Captain!